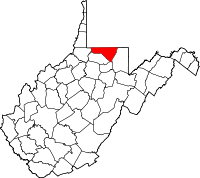 Map of West Virginia highlighting Monongalia County. In yesterday’s post I talked of how Richard and Elizabeth Haught Tennant, along with some of her family migrated to Monongalia County. The county was named after the Monongahela River. Spelling was very fluid in these times so care was not taken to ensure exact spelling. Where does the word Monongahela come from? The meaning of the word Monongahela has been stated many different ways. The Navigator, published in 1821, at Pittsburgh, says that it is an Indian word, meaning “the river of falling banks”. Another account makes it mean “the river of sliding banks.” Either way, I think we can be sure that it was named for its habit of the river cutting under its banks and eroding the nearby land. This entry was posted in Tennant and tagged Family history, genealogy, Monongahela River, Rene Baron, Sylvia Rene Stevens. Bookmark the permalink.